Date palm (Phoenix dactylifera L. Arecaceae family) is an ancient crop of Southwest Asia, widely known for its nutritional and therapeutic values. Date fruits are rich in carbohydrates, dietary fibres, proteins, minerals, vitamins etc. The therapeutic potential of date fruit is well documented in Ayurveda (Indian traditional medicine) and Middle Eastern folklore. Date fruits are highly nourishing and possess immense health benefits, which is highly attributed to the presence of phytochemicals viz., polyphenols, flavonoids, anthocyanins etc. 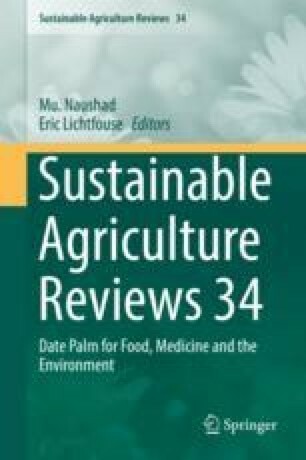 This chapter speaks about the nutritional and pharmacological effects of date fruit. Date fruit is a real gift to mankind, because it’s a unique combination of a natural product being tastier, inexpensive encompassing high nutritional and medicinal properties.